PostAdsViewAds.com is a free advertising system based around member text ads. PostAdsViewAds.com is targeted at work from home moms and dads, home based business owners, direct sales and network marketing professionals, internet marketers, affiliate marketers and anyone that is looking to make money online. 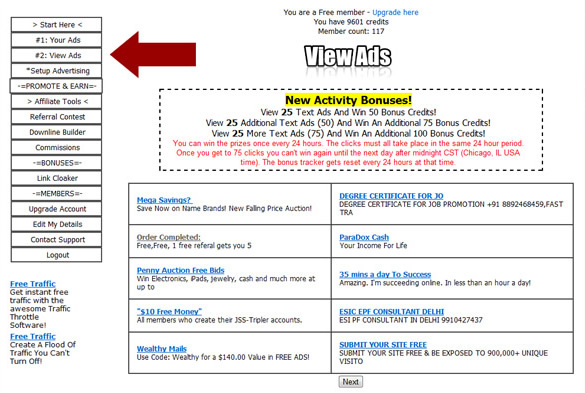 Visitors as well as members come to PostAdsViewAds.com and click on member ads, so your sites will be seen! Clicks to your ads = traffic. Members click on ads in order to earn credits. Members can then use these credits to keep their ads active and in rotation in the ad network. Text ads work - plain and simple. If they did not work so well, all the search engines would have banner ads running up and down the side of their pages instead of text ads right? Here is a quick overview of how to earn credits. You use your credits to apply them to your ads. Each credit equals 1 impression. The 1st way to earn credits is by viewing ads in the members area. Then click on the ad you wish to view. You will earn credits after 6 seconds for each website. If you don't login to the members area you can still earn credits. Every day around 12 Noon CST you will get an email with subject "Recommended ads". Inside the email will be 10 random member ads. When you click on each link to view the website, you will earn credits. In the same email at the bottom, there will be one more link you can click to earn credits. When you click this link, you earn the same amount of credits as if you had clicked on a solo ad credit link. It will take you to a page where you can view up to 20 more ads. And finally, the other way to earn credits is to click on credit links in solo ads. No more than 5 solo ads will be sent in a 24hr period.